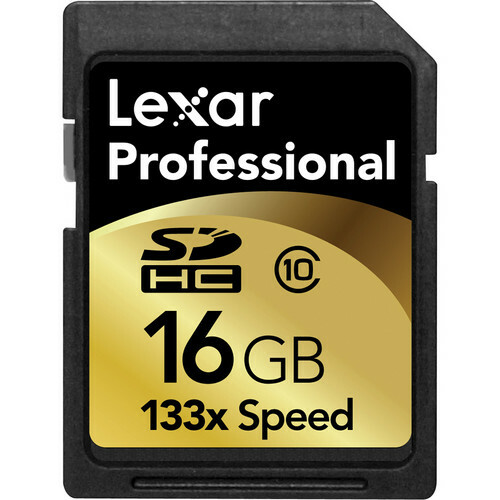 The Lexar 16GB SDHC Memory Card Professional Class 10 is a high-speed memory card with a speed rating of Class 10. It is capable of minimum transfer speeds of up to 20MB per second, allowing users to fully leverage the power of the digital camera's high-speed processor, making it an ideal choice for professional photographers and advanced hobbyists. The card has a limited lifetime warranty. 16GB SDHC Memory Card Professional Class 10 is rated 4.8 out of 5 by 209. Rated 3 out of 5 by bullshark from A disapointment I bought this to use in a D7000 specifically for video, thinking it would be fast. Well, in actuality, this card is slower than the PNY I had purchased earlier, and, furthermore, it has less capacity even thought they are rated the exact same. The 16 GB class 10 PNY give me 831 raw, 12 bit shots while I get only 802 with this one; furthermore, while both card work ok for videos, I get much faster speed in burst mode using the cheaper PNY than this one. Very disappointing considering the only reason I purchased this, at a higher cost, was to get better performance. Well, it does work, but doesn't deliver on the performance at all. Rated 5 out of 5 by Scorg7 from Make sure you have plenty of media! I like these little Lexar cards! I think they're great! In fact I just bought my 3rd 16gb card. This past week, I was traveling and filming an event w/ my Canon 60D I filled up (2.5) 32gb cards (3) 16gb cards (1) 8 gb card I could have used even one more card! So, it's never bad to have a few extra of these if you're shooting video! If you're taking pictures... that's a different story. But I've been very happy with these cards. And prefer them over the non-name brand cards that are out there that everyone writes reviews on saying they lost their data. Stick with name brand cards! Rated 5 out of 5 by Anonymous from I will recommend to friend..Good quality Actually, I just bought the memory card last December. As my Christmas gift to my boss. Since my boss hobby is scuba diving. I was looking for a huge memory space for a memory card could be use for under water camera. For sure obliviously, I will buy a good quality of memory card to my boss. I don't want my boss to feel embarrass. Specially, it is difficult to take good pictures under water. My boss really appreciate the durability, the speed and reliability performance of the memory card. He is now enjoying scuba diving taking picture here in the Philippines. Cheers!!! A+++ I will recommend to a friend who loves photography. Rated 5 out of 5 by Jordan from Works as promised, and a great price! I purchased this card for my new Canon 60D. 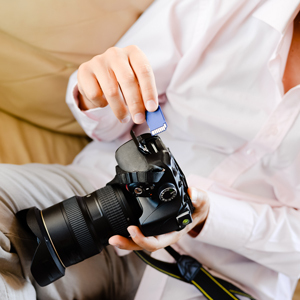 I wanted something fast for shooting video, as well as not having to wait for the camera's buffer to write to the card if I ever needed to shoot many still photos in a fast succession. The class 10 specification promises high speed, and the card delivers on that promise. I've never had a problem shooting full HD 24p video. I know that slower cards can sometimes automatically stop recording during video recording due to not being able to write fast enough, but this has never happened with this card. I have no complaints about this card, or the price here on B&H. Rated 5 out of 5 by Mark from Top notch for less than Sandisk! I needed a fast card to record HD video, and not all class 10 cards are created equal! After reading about so-so performances from cheaper cards like PQI and Transcend (and even a few scary stories of data corruption), it seemed the only option for professional video recording would be Sandisk. But Sandisk charges a small fortune for their cards, and I just couldn't justify the price. Enter the Lexar pro series. These cards are serious, both in speed and reliability. But, unlike Sandisk, you're not paying for the brand-name. They're not cheap cards, but they are a bargain for their speed and build quality. I found them on sale and bought 2 here. Great purchase. Rated 4 out of 5 by sheik124 from Overall good buy This card was purchased mainly for DSLR video with a Canon T2i. A speed test on my computer showed that it actually delivers on roughly 20 MB/s read & write; both are a little over. Tried doing some burst shooting for fun, and got no lag shooting; although I don't normally worry about a card keeping up with a burst of 20-30 shots. I would have given it five stars if it didn't pull a Movie recording has been stopped automatically on me during an important take. Rated 4 out of 5 by Gerald from Pretty good! I bought this card along with a Canon EOS Rebel T2i, and I went in thinking this card would work flawlessly. I'm not sure if it's the card, or my camera, but sometimes when I'm recording video, it cuts off due to the card not writing fast enough. I tried changing all kinds of settings and reformatting my card, but it still cuts offjust sometimes though. Other than that, it writes pictures and transfers WONDERFULLY.